Below you will find Solar Decathlon news from the Santa Clara archive, sorted by date. Compelling. That’s what the stories behind the Solar Decathlon represent to me. Normally, I am focused on the current competition – working with the university teams and our partners to host the Energy Department’s largest public event showcasing student-built solar houses. But lately, I’ve had the chance to learn more about where the 2013 and 2015 competition houses ended up as part of a major website update. That’s why I’m proud to say our Where are the Houses Now historical archive now covers the fate of all past U.S. Solar Decathlon competition houses from 2002 to 2015. Temperature control, whether heating water for a bath in winter or cooling a bedroom on a blazing summer day, is essential to a comfortable home. It is hard enough to get selected as one of the 20 university teams to participate in the U.S. Department of Energy Solar Decathlon, then to spend two years designing and building a competition house on campus, and finally to transport that house to the Solar Decathlon competition. But now it’s a race against time to reassemble the house at the competition site in California in just nine days. Hangout With Solar Decathlon 2013 Teams on Sept. 18! Editor’s Note: This entry has been cross-posted from DOE’s Energy Blog. 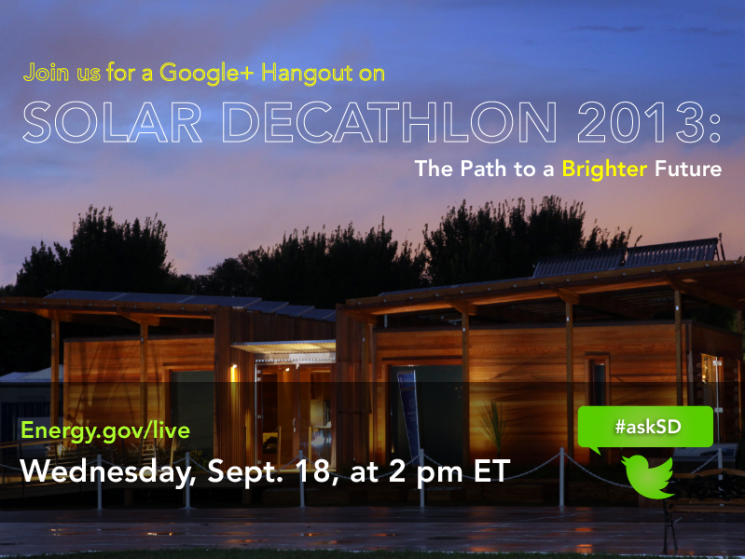 Mark your calendars for a Google+ Hangout on Solar Decathlon 2013: The Path to a Brighter Future on Wednesday, Sept. 18, at 2 p.m. ET. For more than 10 years, the U.S. Department of Energy Solar Decathlon has been preparing the next wave of energy leaders—providing hands-on experience in designing and building energy-efficient, solar-powered houses. As teams put the finishing touches on their entries for this year’s event—which is less than three weeks away—a few teams are taking time to answer your questions about what it takes to be a solar decathlete and how the competition will impact their careers.